Another interesting tidbit from the upcoming Steve Jobs biography by Walter Isaacson quotes Jobs telling President Obama, 'You're headed for a one-term presidency', reports the Huffington Post. According to the book, Jobs nearly missed meeting Obama in 2010 because he wanted a personal invitation from the President. The standoff lasted for five days before Jobs relented and they met at the Westin San Francisco Airport. "You're headed for a one-term presidency," he told Obama. He insisted that the administrator needed to be more business friendly and cited the ease with which companies could build factories in China unlike the U.S. where regulations and unnecessary costs make things difficult. Jobs also criticized the education system in America, saying it was "crippled by union work rules." "Until the teachers' unions were broken, there was almost no hope for education reform." Jobs reportedly proposed allowing principals to hire and fire teachers based on merit, that schools stay open until 6 p.m. and that they be open 11 months a year. 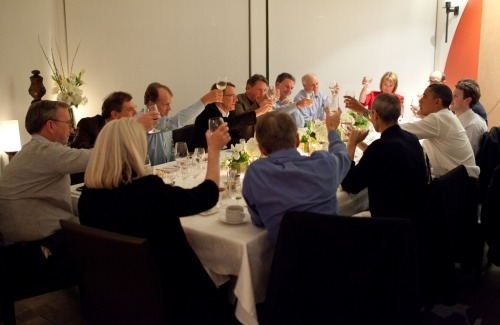 Finally, Jobs suggested that Obama meet for dinner with six or seven other CEOs who could help express the needs of innovative business. When the White House began adding too many names to the list of attendees, Jobs said that it was growing too big and that "he had no intention of coming." Exhibiting his notorious attention to detail, Jobs also complained the menu was far too fancy and objected to a chocolate truffle dessert. He was overruled by the White House which cited the president's fondness for cream pie.